Sydney Airport and tourism operators have hailed Air China’s coming launch of direct services between Sydney and Chengdu in western China. A new promotional partnership with the NSW Government has been set up. The service begins this November. Chengdu is the capital of southwestern China’s Sichuan province. Air China will operate the route with A330-200 aircraft with 237 seats. “We are very excited to welcome Air China’s new Chengdu service to Sydney, which is expected to bring 23,000 Chinese visitors and contribute around $89 million in additional visitor expenditure per year,” Sydney Airport managing director and chief executive, Kerrie Mather, said. Air China general manager Australia, Rui Jie, said the airline was pleased to expand its Sydney services. “This new route to Sydney marks Air China’s third intercontinental flight from Chengdu and our first non-stop service between western China and Oceania,” Rui said. 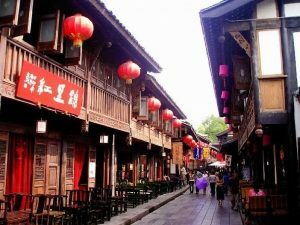 Tourism Australia Managing Director John O’Sullivan said Air China’s new Chengdu service highlighted the increasing importance of China’s secondary cities in driving Australia’s tourism growth. Following the launch of Chengdu-Frankfurt and Chengdu-Paris flights, this route is Air China’s third intercontinental flight from its Chengdu hub, and also its first nonstop service between western China and Oceania. Air China runs direct flights from Beijing and Shanghai to Sydney and Melbourne, with 30 flights every week between China and Australia. The airline plans to launch Shenzhen-Melbourne service at the end of 2016. Chengdu is Air China’s second largest hub after Beijing, offering connections to over 47 destinations within China and international cities including Frankfurt, Paris and Rome. The airline’s A330-200 business class cabin features 170-degree flatbed seats, an AVOD entertainment system and limousine service in Chengdu. Its economy class offers a 32-inch seat pitch. Sydney Airport has implemented a China ready strategy to welcome Chinese passengers, with Mandarin-speaking airport ambassadors, digital channels and wayfinding in simplified Chinese, acceptance of Union Pay, supporting events such as Lunar New Year, and tailored retail, food and beverage offerings.